Blasting on Coal River Mountain was halted due to a tree sit by three activists: Eric Blevins, 28, Amber Nitchman, 19, and David Aaron Smith, 23. On standby at the trees’ base were the direct supporters Josh Graupera, 19, and Isabelle Rozendaal, 22.﻿ Associated with Climate Ground Zero and Mountain Justice, these activists are opposed to the devastating process of mountain top removal (MTR) going on at Coal River Mountain. 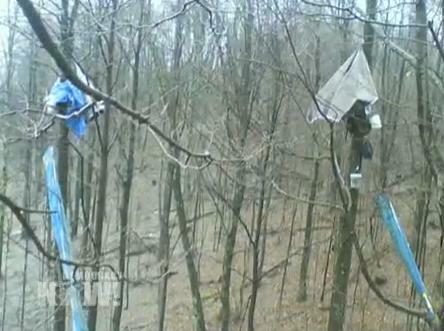 Perched 60 feet in the air in tulip poplars and oak trees just a stone’s throw from the blasting site these activists risked their own well being in a direct action attempt to halt the exploitation of Appalachia. Too often people talk about how terrible something is without any action behind their words. These individuals not only understand that MTR mining must be stopped, they are willing to risk their safety and liberty to non-violently bring its operations to a halt – if even for only a day. If every person in this country who was concerned about MTR mining followed their example it would be shut down forever. The time is long past when we should have stopped using coal for fuel in general. That we are now destroying the second most biologically diverse ecosystem on the surface of the planet in order to allow companies like Massey to stay competitive with other coal mining companies is grossly obscene. These individuals should be commended by anyone who cares in the slightest about the health of our environment and the health of the general public – and as many people who can should join in their acts of non-violent civil disobedience.